I learned everything I know about making money online from reading other website’s income reports. I think more people could be making money online from their passions. If other income reports helped me, then maybe publishing my own will assist someone else, or inspire them to start in the first place. Also, going through all the numbers and stats in detail every month to put these reports together helps me understand what is working for us and what isn’t. Display Ads (Mediavine) – The ads you see on the sidebar and in a post. Amazon Affiliate – When I link to an ingredient or product on Amazon, if the user buys that or other items within 24 hours, we make a small percentage of the sale. Sponsored Posts/Freelance – A sponsored post is a post that a brand is paying us to showcase their products in. We also occasionally do freelance recipe development and photography that is published on sites other than our own. RPM is a common way of measuring online revenue. It stands for “Revenue Per Mille” and refers to how much revenue is made per thousand visitors. This month our RPM is $13.71. This is a decrease from last month, mostly because we made less from sponsored posts. Our monthly Amazon income is usually somewhere between $100-$200. I’ve planned to increase it for awhile, but had not taken any steps towards that until this month. I’ve been testing one simple thing on our top 5 posts. This increased our Amazon earnings by about 30% in just one month. I was able to create and install these ads in less than 5 minutes. If you’re already an Amazon affiliate, just go to the homepage of your account. Look at the top navigation menu and select Product Linking —> Native Shopping Ads. Here, you will be able to create the code for your native ads. I chose to make recommendation ads and have not yet played around with any other variations. These ads have been so successful on the posts we’ve added them to so far that I plan on rolling them out across the entire site. I currently have them displayed at the very end of our posts, but I suspect moving them to the middle or top would increase the RPM. The question, as always, is would it be worth diminishing the user experience? I’m not willing to test that out at this point, so they will stay put at the end. Even though it may seem early, towards the end of July we start to focus the majority of our attention on Fall recipes. Fall is, without a doubt, the biggest time of year for food bloggers. So many types of recipes are popular: back to school, game day, soups, Halloween, hearty meals, and Thanksgiving. That’s a lot of food in just a few months! I’m currently planning what new recipes we will be making and what past seasonal recipes should be reshot or have a video added. It can be difficult to think about what Fall meals I want to make when it’s over 100 degrees here in Los Angeles. Times like these make me thankful for my overactive imagination! Have A Question Or Comment About Food Blogging? 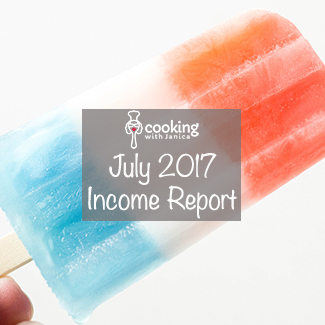 If you’re a blogger reading this, I’d love it if you could let me know what you’d hope to get out of these income reports. Do you need help with a certain social media platform? SEO? Monetization? Whatever it is, I’d be happy to share my knowledge about it in a future report. Just sent a quick email to hello@cookingwithjanica.com.